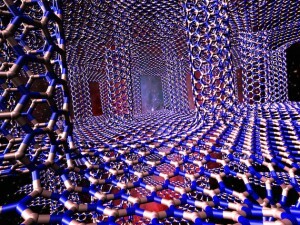 White graphene takes the heat; nanoscale electronic materials; synthesizing nanostructured nanowires. According to researchers at Rice University, 3D boron nitride structures excel at thermal management for electronics. Rice researchers Rouzbeh Shahsavari and Navid Sakhavand have completed the first theoretical analysis of how 3D boron nitride might be used as a tunable material to control heat flow in such devices. 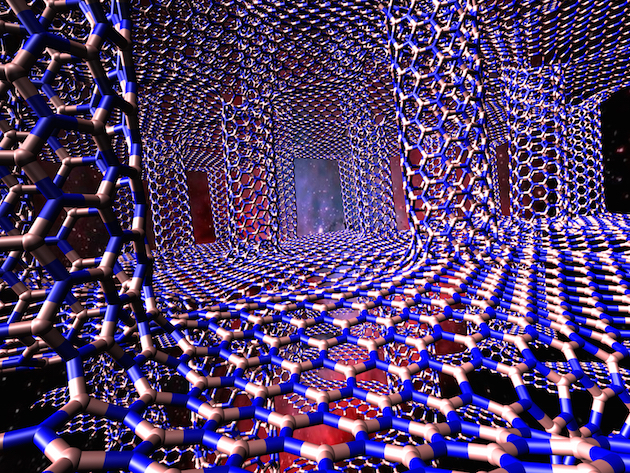 In its 2D form, hexagonal boron nitride (h-BN) — aka white graphene — looks just like the atom-thick form of carbon known as graphene. One well-studied difference is that h-BN is a natural insulator, where perfect graphene presents no barrier to electricity. Heat moves ballistically across flat planes of boron nitride, too, but the Rice simulations showed that 3D structures of h-BN planes connected by boron nitride nanotubes would be able to move phonons in all directions, whether in-plane or across planes. The researchers expect this type of 3D thermal-management system could open up opportunities for thermal switches, or thermal rectifiers, where the heat flowing in one direction can be different than the reverse direction. UCLA researchers have created a technique that they believe could help scientists better understand a tiny — but potentially important — component of next-generation electronic devices. They reminded that scientists trying to improve the semiconductors that power our electronic devices have focused on a technology called spintronics as one especially promising area of research. Unlike conventional devices that use electrons’ charge to create power, spintronic devices use electrons’ spin. The technology is already used in computer hard drives and many other applications — and scientists believe it could eventually be used for quantum computers, a new generation of machines that use quantum mechanics to solve complex problems with extraordinary speed. To improve performance in spintronics, a class of materials called topological insulators could be used. Unlike ordinary materials that are either insulators or conductors, topological insulators function as both simultaneously — on the inside, they are insulators but on their exteriors, they conduct electricity. However, they have certain defects that have so far limited their use in practical applications, and because they are so tiny, scientists have so far been unable to fully understand how the defects impact their functionality. The UCLA researchers said they have overcome that challenge with a new method to visualize topological insulators at the nanoscale. The new method is the first use of beta‑detected nuclear magnetic resonance to study the effects of these defects on the properties of topological insulators. The technique involves aiming a highly focused stream of ions at the topological insulator. To generate that beam of ions, the researchers used a large particle accelerator called a cyclotron, which accelerates protons through a spiral path inside the machine and forces them to collide with a target made of the chemical element tantalum. This collision produces lithium-8 atoms, which are ionized and slowed down to a desired energy level before they are implanted in the topological insulators. The researchers said this method is particularly well suited for probing regions near the surfaces and interfaces of different materials. A new approach to self-assemble and tailor complex structures at the nanoscale has been developed by an international collaboration led by the University of Cambridge and IBM. This development is expected to open opportunities to tailor properties and functionalities of materials for a wide range of semiconductor device applications. The researchers have developed a method for growing combinations of different materials in a needle-shaped crystal called a nanowire. Nanowires are small structures, only a few billionths of a meter in diameter. Semiconductors can be grown into nanowires, and the result is a useful building block for electrical, optical, and energy harvesting devices. The researchers have found out how to grow smaller crystals within the nanowire, forming a structure like a crystal rod with an embedded array of gems. They explained that nanowires are often grown through a process called Vapour-Liquid-Solid (VLS) synthesis, where a tiny catalytic droplet is used to seed and feed the nanowire, so that it self-assembles one atomic layer at a time. VLS allows a high degree of control over the resulting nanowire: composition, diameter, growth direction, branching, kinking and crystal structure can be controlled by tuning the self-assembly conditions. As nanowires become better controlled, new applications become possible. The technique that Hofmann and his colleagues from Cambridge and IBM developed can be thought of as an expansion of the concept that underlies conventional VLS growth. The researchers use the catalytic droplet not only to grow the nanowire, but also to form new materials within it. These tiny crystals form in the liquid, but later attach to the nanowire and then become embedded as the nanowire is grown further. This catalyst mediated docking process can ‘self-optimise’ to create highly perfect interfaces for the embedded crystals. To unravel the complexities of this process, the research team used two customised electron microscopes, one at IBM’s TJ Watson Research Center and a second at Brookhaven National Laboratory. This allowed them to record high-speed movies of the nanowire growth as it happens atom-by-atom. The researchers found that using the catalyst as a ‘mixing bowl’, with the order and amount of each ingredient programmed into a desired recipe, resulted in complex structures consisting of nanowires with embedded nanoscale crystals, or quantum dots, of controlled size and position. Possible applications for this technique range from atomically perfect buried interconnects to single-electron transistors, high-density memories, light emission, semiconductor lasers, and tunnel diodes, along with the capability to engineer three-dimensional device structures.